Published in 1989 by Ishi Press, a translation of a Japanese book by Cho Chikun. It deals with counting as a strategic tool. Malweth: I'm reading this book now. IMHO this is an excellent reference for midgame counting and should be read through multiple times (I'm on my first read still) by the strong kyu player who is really learning to value the size of moves. I'm convinced that this book will be a major factor pushing me to the 1d AGA mark. The black moyo on the right has 57 points, and the white moyo has about 50 points. Obviously, neither of these are completed territory yet, but either of them could conceivably become this number of points. White has about 10 points on the top, plus 5.5 points komi, and Black has about 14 points on the bottom, so the positions are currently about even. 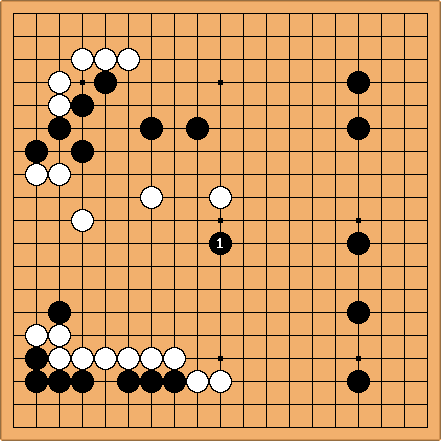 Now the White moyo on the left is worth only about 30 points, and on top of that, Black has built a huge framework on the top and and right. This would be a failure for white. White 2 does not defend the left side moyo directly, but cutting off the black stones at "c" later may be possible. White can also now aim at points on the right such as "a" and "b". Defending at 3 would have been too small-scale-- White opted for a large-scale fight instead. The moral of the story, in Cho's words as translated by Stuart Dowsey: "Moyo can portend real territory, but undue worry over how to secure such territory can lead to failure."